He also posted something similar on Twitter. People across the United States celebrated Independence Day on Wednesday by barbecuing, shooting off fireworks, or heading to the beach. Donald Trump Jr., however, decided to mark the holiday by posting a bizarre picture of President Donald Trump as a revolutionary on Instagram. The photo features the president dressed in clothing from the Revolutionary War, standing on a pile of smoldering ruins as he holds an eagle on his arm, and brandishes a giant machine gun behind the American flag. The reason for posting such an odd image? It was “amazing,” according to the Trump Jr.
“This is amazing. #fourthofjuly #4thofjuly #trump #maga 礪礪礪” he wrote on Wednesday evening. But Trump Jr. wasn’t done with the bizarre pro-Trump imagery on social media. On Wednesday evening he also posted a GIF of the president standing on a tank emblazoned with his last name that was carrying a large American flag. 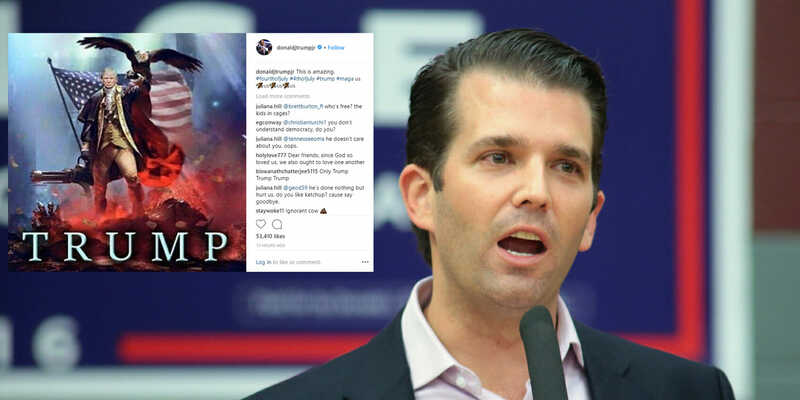 It’s unclear why exactly Trump Jr. decided to post fan art version of his father, however he has a long history of using his Twitter account to try and get the president’s attention through some obvious flattery. In fact, his Instagram page has slowly devolved into memes you’d find on a conservative uncle’s social media channel mixed with photos of him posing with his children, hunting, or fishing. Except the memes are about his dad. Update 10:01am CT, July 5: Not to be outdone by his posts on the actual holiday, Trump Jr. posted another meme on Thursday.